Our babysitter of the last two years is having a baby boy next month and I wanted to make something special for her. I used Anna Maria Horner’s Little Folks Voile combined with Peppered Cotton by Pepper Cory in a Quilt As You Go hexagon pattern I learned about in the book Quiltopedia by Laura Jane Taylor. I call it “Flower Pots” because the center earth tone looks like soil for Anna Maria’s voile flowers. I think the neutral grounds (forgive the pun) the bright fabrics well. So fun to try a new quilting technique. And to all my crafty friends, Umbrella Prints is now displaying their 2014 Trimming Competition Entries. Check out my two bag entries as well as all the other lovely handmades there. Vote for your faves by commenting on their Pinterest snapshots. Now I’m off to buy some flowers for my own garden. That looks really neat! I like the look of the technique you used, but am a bit intimidated by how time-consuming it appears to be. You must have a fantastic sitter! I am definitely on the intimidated side of the hexagon fence, so good for you for finishing it and not naming it as you suggested. 🙂 What a lovely gift; I hope she and the new baby love it! It’s a beautiful quilt! i love all the colours on the back and the quietness on the front. Fantastic! Thanks so much Sonia. I am loving YOUR work lately. How is it that you stitch your wonderful goodies up so quickly? You are so fast with them and they are so intricate. I am amazed by the beauty of this quilt. Your sitter will love it! This is truly amazing! I love it! How long did it take you? Hexies are already fiddly, but filling them with batting too? Wow. Great job! This is gorgeous! 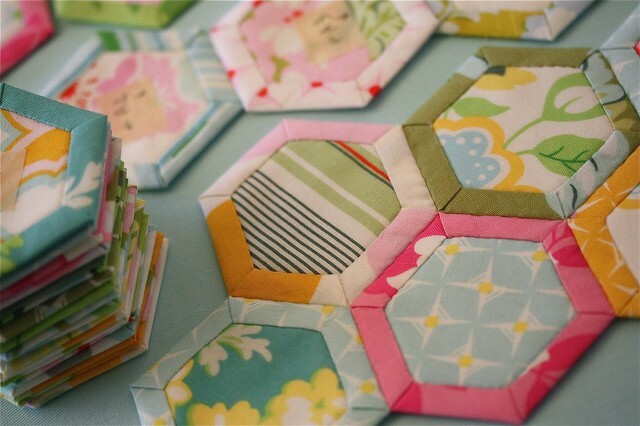 I love the solids in the middles, and the fact that there are full color hexies on the back. What a cool quilt! Thank you so much. I think this quilt could be done so many different ways. I would love to see what people would come up with. This is just spectacular – I love the soil centres so much and this looks to be an easier way than paper piecing small strips all around. I’ll have to check out this book. I hope your babysitter realises what an heirloom piece you’ve made for her! (I’m not so sure I could let this go if I’d made it.) It’s gorgeous. Aw thanks Kirsty. I’m kind of drowning in handmade stuff and it makes me so happy to gift my things away. It’s all good. I hope it’s obvious from my post that the quilt I made is NOT in the book but the technique for making the QAYG hexies is. It was a fun project-would love to try it in other ways. This was the picture that I had loved the look of but couldn’t bring myself to start because of the work involved. I like your take better – especially doing it by machine. I’m really glad to have found you too – I love all your bold, geometric designs in particular, they’re just gorgeous. And I love how you use other substrates – denim, corduroy and boy, that quilt you made from your friend’s mother’s nighties, that was so beautiful on every level I can think of. Oh Kirsty I love your country (long weekends and all). My sister and brother in law just got permanent residency and have a house in Gerringong and my niece just finished her Masters in Public Health at the University of Sydney. Of all the places our family has traveled (which is a lot) my kids love Australia the most (plus you have such great quilters and independent fabric makers) :). I was in the same boat as you with the AMH voiles and always a little worried that they were too thin for a quilt. Beefing them up as I did this quilt made sense. Look foward to seeing what projects you sew up. Love the paper piecing-need to try that out. Love, love, love YOUR quilt. Those improv flowers are pretty amazing! Thanks Kim. It was fun to check out your blog and quilts-gorgeous! You just got me thinking. I think I am going to try this. Thanks for sharing. Exciting! I’ll look forward to seeing what you come up with.